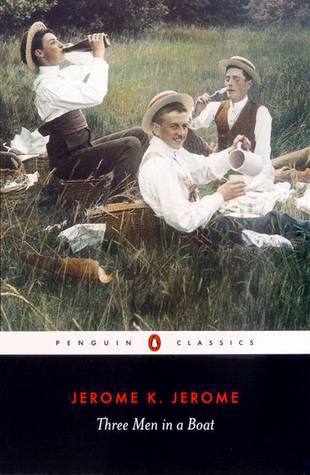 I’ve wondered about reading Three Men in a Boat: (to say nothing of the dog) by Jerome K Jerome for many years – I first heard about it when I was at school when one of my friends read it and said she thought it was very good. And since I’ve been blogging I’ve seen that people love this book and think it’s very funny. So, I decided that it was about time that I read it. When Jerome began writing this book he intended it to be a serious travel book about the Thames, its scenery and history, but, as he wrote it turned into a funny book. The Thames remains at the centre of the book but it is also full of anecdotes about the events that happened to him and his friends whilst out on the river, interspersed with passages about the scenery and history. The main characters were real people, Jerome’s friends – ‘George‘ is George Wingrave who was the best man at his wedding, and ‘Harris‘ is Carl Hentschel, a photographer. Only the dog ‘Montmorency‘ is fictional. This book was first published in 1889, which means that the descriptions of the places they passed through or stayed the night, are like a snapshot in time of what life was like in the Thames Valley, showing the how use of the river had changed with the coming of the railways for transporting goods. Cheap excursion tickets to stations along the river also meant that people could reach places like Henley, Hampton Court and Windsor as the river became the place for picnics, and regattas and hiring skiffs and punts. As time went on the river became more and more popular for fishing, boating and photography as well as a fashionable venue for young ladies to parade their elegant dresses. It’s a story of a journey, comparing their trip to Stanley’s expedition to Africa searching for Dr Livingstone. It’s satirical, ironic and farcical.The book is composed of amusing mishaps and situations as the three friends decide what to take with them and what not to take, come across the problems of packing and unpacking the boat, where to stop the night, what food to take, and showing how they entertained themselves, for example singing comic songs, accompanied by George’s banjo, and ending in sentiment as they break down in tears singing ‘Two Lovely Black Eyes’. George’s tale of getting lost in the Hampton Court Maze made me chuckle as time after time whichever route he took he couldn’t find the way out. It’s a gentle witty book that kept me entertained all the way through – and I can’t say that for every book I read. It’s been on my Classics Club list from the first time I complied my list in 2013 and it’s also a book I’ve owned for over 11 years. It does sound like an interesting chronicle of a journey, Margaret. And I like the idea of choosing a place that many may think of as familiar, and really exploring it. I’m glad you enjoyed this. One of the reasons I enjoyed it so much was following the route they took on their tour of the Thames. Like you, I’ve been meaning to read this for years. Unlike you, however, I haven’t yet got round to it. Didn’t someone write an update of it, relatively recently? Or perhaps it was a reconstruction of the trip done for the radio? There’s some such memory wandering around in my brain trying to get out. I think my brain must have been conflating two things, Margaret. There have been several radio adaptations, the most recent in 2013. I seem to have linked this erroneously with the television series where three comedians, including Griff Rhys Jones, recreated the trip. Oh dear – I’d forgotten all about that TV series! I do remember it now you’ve mentioned it. I love this book and just reading your review makes me smile. The Hampton Court Maze scene is one of my favourites. There are so many scenes I could have included in my post – the Hampton Court Maze scene is one of my favourites too. Yes, I think I’ll be reading more of his books next year too. I’ve read this a couple of times with many years between, so the second time was fairly fresh and thus I loved it both times. Three Men on the Bummel is also very good, also Idle Thoughts of an Idle Fellow and After Supper Ghost Stories. I read a biography about him and his was a very interesting life. It was two real-life ghost experiences he had on the battlefields of WW1 (he drove ambulances) that started me reading all the ghost stories I could find years ago. This has been on my shelf for several years, Margaret! Someday I’ll get to it. So glad you enjoyed it. His other books are worth reading too.